On this blog, I love to embrace and support beginners. After all, nobody is born knowing everything about motorcycles. But it’s important to remember that what you don’t know can hurt you. I’ve long believed this about riding motorcycles, which is why I urge new riders to learn at their own pace. But it wasn’t until recently that I recognized how much it was true of working on motorcycles, too. Here’s what I mean: Awhile back, I bought several packs of microfiber cloths for my garage. My thinking was I could wash and re-use them, like kitchen towels. Before I knew it, I had a bucket full of oil-and-brake-cleaner-soaked rags. And it took a few months for me to realize that I had a serious fire hazard on my hands (if my landlord ever reads this, I am so, so sorry!). After taking care of the rags, I decided this was a come-to-Jesus moment in my DIY mechanic career. It was time for me to get serious about garage safety. So, when I wanted to learn more about garage safety for beginners, I thought, who better to ask than Matt? I sent him some questions, and, in response, he produced a video, just for me. Thank you, Matt! In the video, Matt covers safety issues such as essential safety tools, hazards beginner mechanics tend to overlook, and the closest call he’s had yet. Of course, Matt is the expert, so I’ll let him handle the specifics. But to get you ready to dive into his wealth of resources, I wanted to share the top garage safety lessons I’ve learned so far. 1) Safety equipment exists for a reason. When I first started working in the garage, I couldn’t get the hang of safety equipment. I knew I should wear gloves and safety glasses, but it felt like all they did was get in the way. For awhile, things were fine. I didn’t love having old grease under my nails all the time, but I didn’t see what the big deal was. Then, I started cleaning parts. I don’t have a parts washer (or room for one), so most of my cleaning involved chemicals. Brake cleaner, aircraft stripper, acetone, muriatic acid… Before long, my garage looked like a meth lab. And the stakes for safety shot up. The first time I thoughtlessly squirted brake cleaner on a part and it splashed back into my eye, I reconsidered my “only for extreme circumstances” policy on safety equipment. After a few minor incidents with harsh chemicals and cuts, I finally began to learn my lesson. Now, I always wear nitrile gloves, and I wear safety glasses any time there’s a risk of flying chemicals or metal. And, I have to say, it’s nice not having to wash my hands five times after working in the garage. 2) Use the right tools. 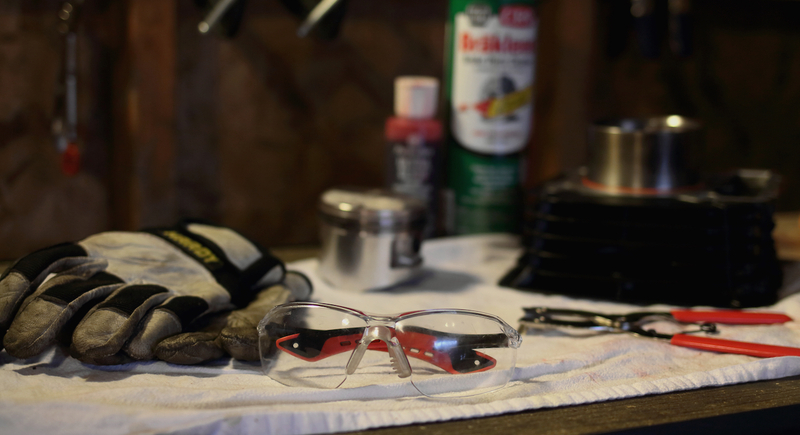 The right tools will make your work easier, but they will also make it safer. Almost every time I’ve hurt myself in the garage, it was because I was trying to “make do” with a ramshackle tool. One of my first garage injuries happened because I was using a too-large socket to remove a bolt. My wrench slipped, and the pent-up force I had put into the wrench sent my hand flying into the frame. The bruise lasted for weeks, and hurt so much it was difficult to loosen any bolts for several days after. Of course, that bruise was a small price to pay for an important lesson. If that’s not a deterrent for you, though, then remember: improper tools can damage your motorcycle, too. A thoughtless wrench or hammer can ding up your bike, and create more problems than it solves. Protect yourself, protect your bike; use the right tools. 3) Slow down and pay attention. My friend Jeff at Second Gear once told me about a new piece of equipment they had gotten at one of his past jobs. It was a heavy-duty piece of machinery, capable of lopping your arm off if you made a wrong move. It’s a funny story, but there’s definite truth to that warning label. About a quarter of the mistakes I’ve made in the garage so far were because I didn’t know something. The rest were because I wasn’t paying attention. In your shop, you have to stay alert and consider the consequences of your actions. As Matt says, angle grinders “don’t discriminate between steel or bone.” None of your tools will stop you from hurting yourself; you have to pay attention. To stay safe in the garage, first you have to know what to look for. So start now: Prime your brain, learn all you can about potential hazards. Then, while you’re working, pay attention to your environment and your actions, and you’ll be just fine. If you want to build your own custom motorcycle, but you have no idea where to begin, I wholeheartedly recommend the resources Matt’s created over at Krank Engineering. His empathy and enthusiasm will provide the direction, support and guidance a newbie mechanic needs. Hey Loryn, spot on with “using the right tool” and “educate yourself”, because you don’t know what you don’t know. If you can get your local community college (here in Australia they are called “Technical and Further Education – TAFE) that is the fastest way to skill up in a controlled and safe environment. I would highly recommend this as the preferred approach. I’d be interested to hear from your other readers! What other lessons have you learnt the hard way? Help save someone else from making that mistake! Thanks Matt!! I hope some day to take some technical education classes, they are undoubtedly worth your while to get up to speed. There’s just no replacement for having a teacher in-person. This is beautiful in its simplicity and information-value, LT!!! Your piece, augmented with Matt’s video, is another long-ball out of the park! As you two are clearly aware, safety rules are – unfortunately – written in blood. 🤕 💀 This edition will benefit anyone fortunate enough to read it. *** WARNING TO YOUR OTHER READERS *** Do NOT Google “Angle Grinder Injuries” as Matt suggests!!! 🤢 You’re Welcome!